Nigerian international Ahmed Musa was arrested at 1am on Wednesday in response to a domestic abuse complaint. Neighbours of the Leicester City forward told The Sun that Musa was picked up by plain-clothed police officers. The officers reportedly spent two hours taking a statement from his wife, Jamila, before leaving with Musa. Musa was held on suspicion of common assault. After being questioned, he was released without charge. “A 24-year-old man was arrested yesterday morning at his home address near Leicester on suspicion of common assault,” said a spokesperson for Leicestershire police. A neighbour told The Sun that, “Ahmed is a nice guy. He always has a friendly smile. I don’t know anything about his private life”. Musa signed a four-year contract worth £16m with Leicester in July 2016, making him the Foxes record signing at the time. A Leicester City spokesperson told the Daily Star that “Musa cooperated with a police inquiry” regarding a disturbance in his house. “The inquiry has since been closed and no further action is to be taken. We see no reason for formal action internally, though Ahmed will be given the opportunity to discuss the matter with football management when the squad returns,” said the spokesperson. 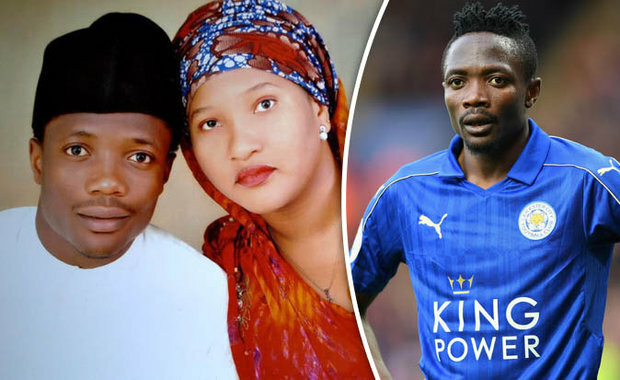 Musa and his wife Jamila have two young children together, Ahmed Jnr and Halima. They live in the city’s Countesthorpe area. The Super Eagles striker was not included in Leicester’s squad against Sunderland on Tuesday.